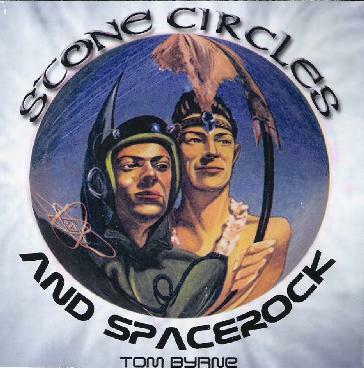 Tom Byrne - "Stone Circles and Spacerock"
The latest from Tom Byrne is not the next in his multi-album tale of ancient Britain, but rather a collection of pieces influenced by both science fiction and ancient times. In addition to enjoying Tom's music, his albums are an extra pleasure to dive into because he always emails me detailed notes about the stories, and in this case various tracks. "Rocking to the Cosmic Callsign" is an instrumental based around the Da Vinci Code favourite, the Fibonacci series. Tom says, as the Fibonacci series is reputed to occur everywhere in nature, it might just be one of those callsigns those 'out there' might use to communicate with us over the airwaves....hence the title of the track. The song features Tom's trademark space-prog keyboards and usual flair for melody, along with a steady rhythmic pattern. I really like the way Tom gives a space rock edge to what is essentially a thematic progressive rock style. A solid opening track. Tom describes "The Warlord of the Air" as being based on the book of the same name by Michael Moorcock and was written for the Michael Moorcock 65th Birthday Project. The song includes narrative styled vocals and is very much in the spirit of Tom's earlier albums. A very cool 10 minute tale delivered progressive rock style. I also dig the way Tom incorporates "The Internationale" melody into the tune. Hmmmmm….. I think a concept album around this theme would have great possibilities in Tom's hands. Ditto for "Cromm Cruach", which Tom describes as a story of people who endured terrible sacrifice and did terrible things in the belief it was necessary for the maintenance of their world - not an unfamiliar state of affairs today. There are also a few lighter tracks on the album. "Lost Times" is what Tom calls an experiment in medieval modal music, and would certainly be a hit at the renaissance fair. "Trentham Awake" is a melodic tune about Trentham, Staffordshire, where Tom was born. Tom did a video for this one too, which I believe it available at his Soundclick.com site. Continuing down the light melodic trail is the brief "Lost Friends", a nice mixture of acoustic guitar and horn sounding keys. And "The Road to Lankhmar" is a synth driven track that Tom says is slated for a future project to be titled , The Howling Tower. Rounding out the set is a rousing cover of Hawkwind's "D-Rider", with Kevin Perry (Assassins of Silence) contributing guitar. And we're also treated to live versions of "A Short Life" and "Eye of the Cyclone", both from Tom's earlier albums, recorded with Michael Blackman (Alien Dream, Space Mirrors) at Hawkfest 2003. Teaming up with Michael is a natural for Tom, as Michael's work in Alien Dream is another outstanding example of blending space rock and progressive influences. Overall another fine album from Tom! For more information you can visit the Tom Byrne web site at: http://www.soundclick.com/tombyrne.